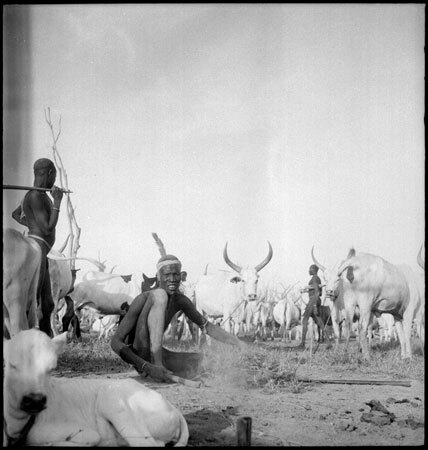 A Mandari Köbora man with a feather plume head ornament sweeps a section of the cattle kraal with a flat wooden tool in the foreground, with cattle tethered all around. The Köbora camped their cattle towards the Nile, sometimes only a few miles from their wet-season villages, where permanent water and sufficient grazing was accessible. Morton, Chris. "Mandari Köbora cattle camp" Southern Sudan Project (in development). 03 Jan. 2006. Pitt Rivers Museum. <http://southernsudan.prm.ox.ac.uk/details/1998.97.317/>.